When looking for a barge cruise in Southern France, an excellent choice would be the 6-passenger Clair de Lune, tastefully furnished with Mediterranean plane tree and American cherry wood furnishings. There is a stylish, modern salon with a comfortable sitting area, a large dining table and a well stocked bar. There are three spacious cabins, each of which can be configured with a queen bed or two twin sized beds. Each cabin has a large wardrobe, dressing table, and an ensuite bathroom, with large shower. The cabins and the salon all have large picture windows. The beds in each cabin face the windows, so that you can enjoy the scenery even from inside of the barge. For easy access, the boat has been built with as few stairs as possible. A very large sundeck takes command on the exterior of the barge, where you can lounge in comfort on reclining chairs. Sun-lovers can soak up the sun and cool down in the Jacuzzi, while those who prefer the shade can relax under the awning while watching the picturesque scenery unfold. The sundeck is a perfect setting to enjoy an al fresco lunch or a leisurely candlelit dinner on beautiful summer evenings. 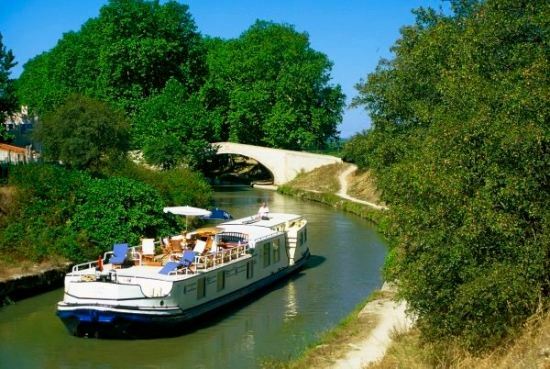 In the spring and fall the Clair de Lune cruises on the quaint Canal du Midi between the charming village of Le Somail and the fortified city of Carcassonne, discovering some of the most beautiful scenery in the south of France along the way. During the cruise you will visit historical sites such as the spectacular Cathar village of Minerve, the elegant city of Narbonne and enjoy wine tastings at renowned local domaines. In the summer it cruises an alternative itinerary on the Canal du Midi passing Carcassonne and Castelnaudary. Excursions include a visit to Limoux for a private wine tasting, the medieval Cathar town of Mirepoix and beautiful Lac de Saint-Ferréol. The Clair de Lune team is led by its French owner, Yves Pastor, who is accompanied by an English-speaking crew: a professionally trained Chef who will be responsible for all of the meals on board, a tour guide who will lead all of the excursions, and a hostess. Yves’ lifelong love of boating and desire to provide a luxury barge experience to passengers from all over the world is what drives his passion for barging. While on board, the crew invites you to relax and enjoy the landscapes and natural beauty of this magnificent canal. This entry was posted in European Barging & River Cruises, France and tagged barge charter, Canal du Midi, Carcassonne, Clair de Lune barge cruise, european barge cruise, family cruise, Family Vacation, french barge cruise, gourmet food, hotel barge cruise, incentive cruise, Limoux, luxury barge, Narbonne, Provence cruise, Wine Cruise, Wine Tastings by Jan European Barging & River Cruises. Bookmark the permalink.